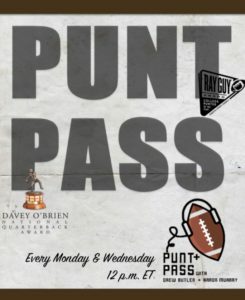 FORT WORTH, Texas (Aug. 22, 2018) – The Davey O’Brien Foundation has announced a partnership with the Punt & Pass Podcast for the 2018 college football season. The Punt & Pass Podcast will make the official weekly honoree announcements for the Davey O’Brien Award as well as the Ray Guy Award throughout the fall. The Punt & Pass Podcast hosts are Drew Butler and Aaron Murray. Butler was a two-time first-team All-American (2009, 2010) and a two-time Academic All-American (2010, 2011) at Georgia. In addition, he was the 2009 Ray Guy Award winner as the nation’s most outstanding punter. Murray, a fellow Bulldog, is the all-time SEC leader in passing yards (13,166) and touchdown passes (121) as a four-year starter at quarterback. He was a Davey O’Brien Award semifinalist in 2012 and 2013, and was named the organization’s National Quarterback of the Week in week 5 of the 2013 season. Each week, the Punt & Pass Podcast will announce the Davey O’Brien “Great 8” list, which features the top eight quarterback performances from the past week, as well as the National Quarterback of the Week. Due to the Labor Day holiday, the opening week’s Great 8 will be announced Tuesday, Sept. 4 at 3 p.m. (ET)/2 p.m. (CT). Beginning Sept. 10, the Great 8 announcement will be made each Monday at 12 p.m. (ET)/11 a.m. (CT). The Quarterback of the Week will be announced Wednesdays at 12 p.m. (ET)/11 a.m. (CT) throughout the season. All 130 FBS quarterbacks are eligible for the weekly honors. Eighty years ago, Davey O’Brien, who wore No. 8 as a star quarterback for TCU, became the first player ever to win the Heisman Trophy, Maxwell Award and Walter Camp Award in the same year (1938). He was inducted into the College Football Hall of Fame in 1955.